BOULDER, Colo.-- JILA physicists and colleagues have identified a long-missing piece in the puzzle of exactly how fossil fuel combustion contributes to air pollution and a warming climate. 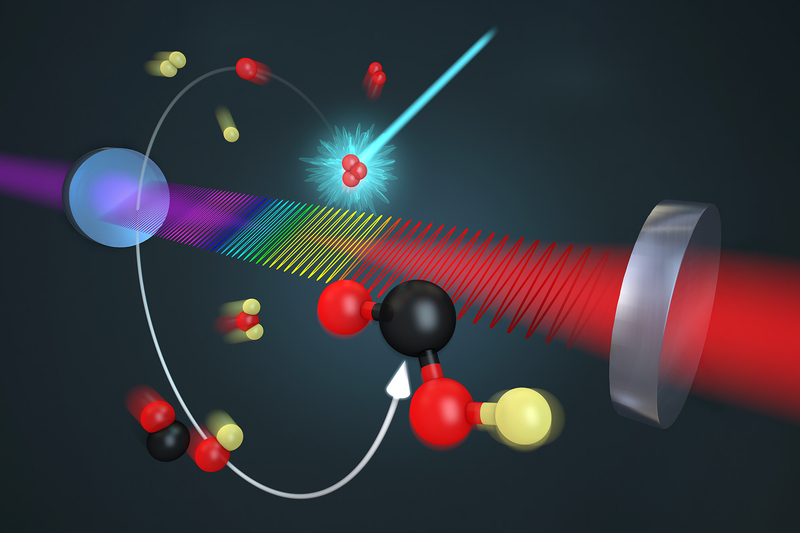 Performing chemistry experiments in a new way, they observed a key molecule that appears briefly during a common chemical reaction in the atmosphere. The reaction combines the hydroxyl molecule (OH, produced by reaction of oxygen and water) and carbon monoxide (CO, a byproduct of incomplete fossil fuel combustion) to form hydrogen (H) and carbon dioxide (CO2, a “greenhouse gas” contributing to global warming), as well as heat. JILA researchers used their frequency comb spectroscopy technique (multicolored lightwaves between the mirrors) to follow each step of an important chemical reaction that occurs in the atmosphere. The technique identifies chemicals in real time based on the light they absorb inside a mirrored cavity. The reaction combines the hydroxyl molecule and carbon monoxide (both at lower left) to form the hydrocarboxyl intermediate (red, black and yellow molecule in the foreground). Eventually the intermediate breaks down into hydrogen and carbon dioxide. Researchers have been studying this reaction for decades and observed that its speed has an abnormal pressure and temperature dependence, suggesting there is a short-lived intermediate, the hydrocarboxyl molecule, or HOCO. But until now, HOCO had not been observed directly under conditions like those in nature, so researchers were unable to calculate accurately the pressures at which the reaction either pauses at the HOCO stage or proceeds rapidly to create the final products. As described in the October 28, 2016, issue of Science, JILA’s direct detection of the intermediate compound and measurements of its rise and fall under different pressures and different mixtures of atmospheric gases revealed the reaction mechanism, quantified product yields, and tested theoretical models that were incomplete despite rigorous efforts. JILA is a partnership of the National Institute of Standards and Technology (NIST) and the University of Colorado Boulder. JILA researchers are performing chemistry in a new way, fully controlling reactions by artificial means instead of relying on nature. They used a laser to induce the reaction inside a container called a laboratory flow cell, through which samples of the molecules participating in the reaction and other gases passed. This process mimicked nature by using gases found in the atmosphere and no catalysts. To avoid any confusion in the results due to the presence of water (which contains hydrogen), the researchers used deuterium, or heavy hydrogen, in the hydroxyl molecule, OD, to start the reaction. Thus, they looked for the DOCO intermediate instead of HOCO. During the experiment, concentrations of CO and nitrogen gases were varied across a range of pressures. Using JILA’s patented frequency comb spectroscopy technique, which identifies chemicals and measures their concentrations in real time based on colors of light they absorb, researchers measured the initial OD and the resulting DOCO over various pressures and atmospheric gas concentrations over time, looking for conditions under which DOCO stabilized or decomposed to form CO2. The JILA team identified an important factor to be energy transfer due to collisions between the intermediate molecule and nearby CO and nitrogen molecules. These collisions can either stabilize the intermediate DOCO or deactivate it and encourage the reaction to proceed to its final products. JILA’s frequency comb spectroscopy technique analyzes chemicals inside a glass container, in which comb light bounces back and forth between two mirrors. The repeated, continuous measurements make the technique especially sensitive and accurate in identifying “fingerprints” of specific molecules. This latest experiment used new “supermirrors,” which have crystalline coatings that reduce light losses and improved detection sensitivity 10-fold. JILA’s results, notably the effects of molecular collisions, need to be included in future atmospheric and combustion model predictions, according to the paper. For example, even at low pressures, the reaction produces a DOCO yield of nearly 50 percent, meaning about half the reactions pause at the intermediate stage. This observation affects calculations that go beyond Earth: Other researchers have shown that HOCO can contribute 25-70 percent of the total CO2 concentration in the cold Martian atmosphere. In the future, JILA researchers plan to extend the experimental approach to study other chemical products and processes. One topic of interest is reactions involving water and CO2, to aid understanding of how atmospheric CO2 interacts with and acidifies the oceans. Also of interest are studies of engine combustion, which affects fuel economy. A car engine combines air (oxygen and nitrogen) and fuel (hydrocarbons) to produce CO2 and water. Incomplete combustion creates CO.
A physical chemist at the California Institute of Technology collaborated on the research. Crystalline Mirror Solutions provided the mirrors. The research was funded by the Air Force Office of Scientific Research, Defense Advanced Research Projects Agency, NIST and the National Science Foundation.